Every once in a while, a recipe pops up in my email inbox that I just HAVE to try. 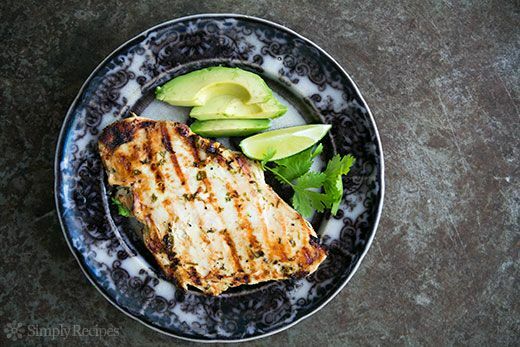 Just yesterday, one of my favorite sites, Simply Recipes, posted a recipe for Cilantro Lime chicken. I’m no stranger to cilantro and lime as a flavor combination, and use it often. But this picture made me crave cilantro lime chicken! Since I was solo for dinner last night, I decided I would fire up the grill tonight and make it. I’m thinking of serving it with a simple salad – mixed greens with baby spinach, red onion, organic cherry tomatoes, cucumber, avocado, and a drizzle of EVOO and balsamic vinegar. If I muster up the strength to venture out into the world, perhaps I’ll pick up some fresh mozzarella to top off the salad. I have some cauliflower I could roast, but it is SO hot that even the thought of turning on the oven makes me want don cement shoes in the deep end of my pool. Wait, was that too drastic? You know what I mean. It is HOT. Simple is the way to go tonight. This entry was posted in Healthy Eating and tagged chicken, chicken recipes, low fat chicken recipes, low fat chicken weight watchers, weight watchers on July 18, 2013 by admin. 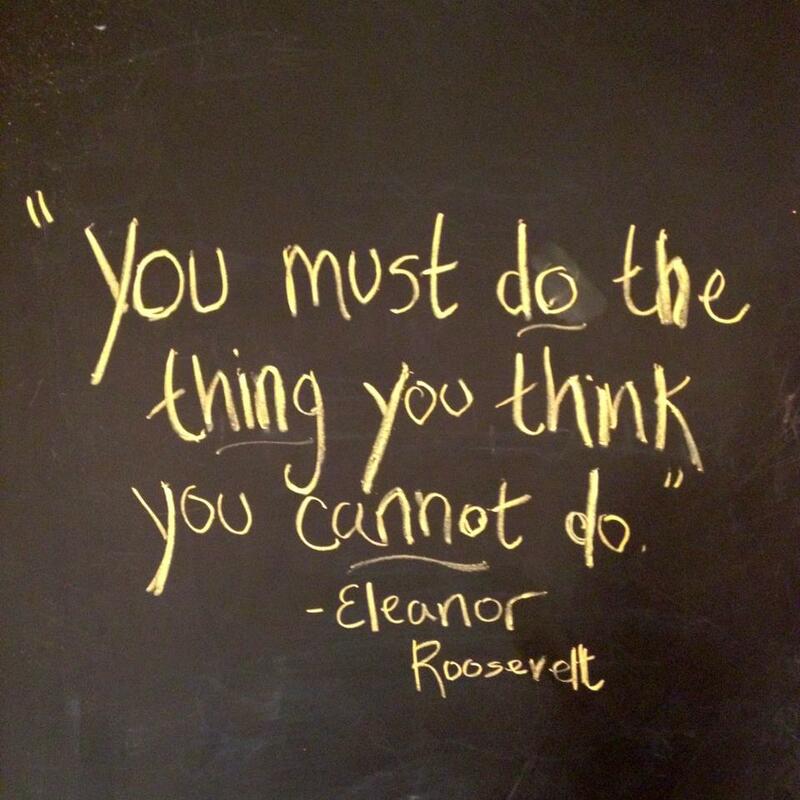 I’ve been hanging out on the Weight Watchers forums a lot lately to get useful tips, recipes motivation, inspiration, and just plain trying to feel “part of something”, to help keep me focused. One thing I turned to the WW forums for was to find some healthy snacks. I don’t really have junk food in the house, and last week I was severely lacking in healthy snacks. I’ve also been dropping starches and carbs, and this has left me way hungrier (and thus grouchier). Every day people post their menus for the day – either what they ate or are planning to eat, including their snacks. I’ve been going through their lists to get some idea for what I’d like for my own snacks. It’s easy to just say “fruit”, but the problem (for me) is that fruit and vegetables are zero points, and I have a lot of points to fill in for the day. I love fruit, but it can’t be my sole snack. Kale Chips – we made these a few nights ago for an “appetizer”. We used a BBQ seasoning – SOOOO good! 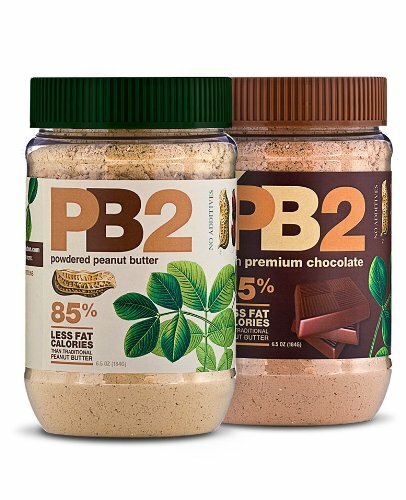 I saw a product recommended on one thread that was new to me – PB2. It’s powdered peanut butter that you can either use as a powder (some people dip their fruits in the powder, some use it for baking, making ice cream, etc), or reconstitute it into peanut butter using water. Roasted peanuts, cocoa powder, sugar, salt. These numbers are significantly lower than those of peanut butter – so I hope it will be a great replacement for peanut butter in my snacks and baked goods. Looking forward to trying it – it arrives on Friday! What are some of your favorite low cal snacks? This entry was posted in Weight Watchers Snacks and tagged healthy foods, healthy snacks, low fat snacks, snacking, weight watchers on March 6, 2013 by admin. I was starving when lunchtime came around today, so I decided to make chicken bruschetta salad. 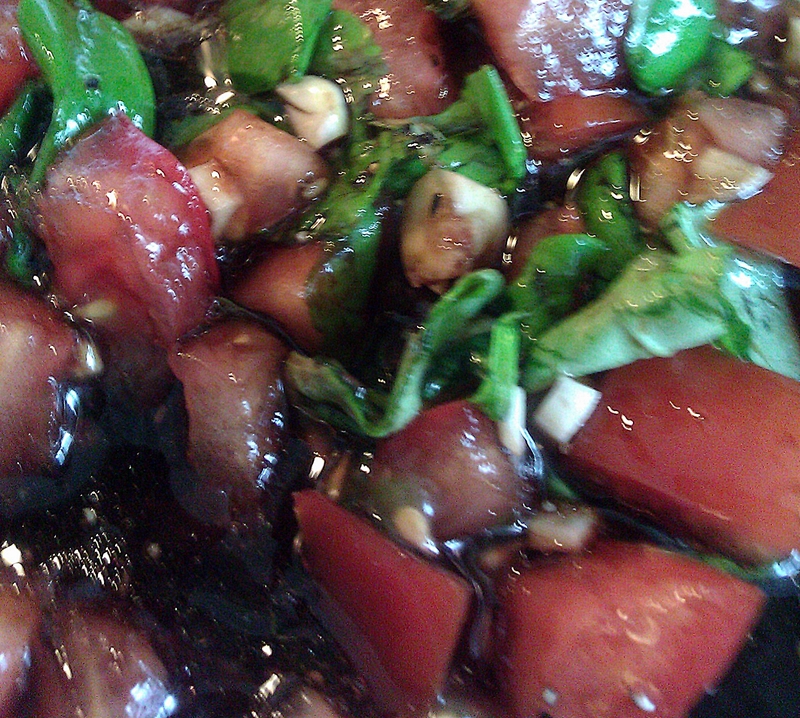 I had some tomatoes lingering around and some remaining basil from some recipes I made earlier this week. When I make bruschetta salad, I just use the bruschetta as my dressing. It’s so fresh and vibrant, and really pops on a salad. Since I was only making bruschetta for one, I diced up one tomato, about 3-4 cloves of garlic (I LOVE garlic and am really trying hard to get it into my diet every day), salt, pepper, and some chopped basil. Then I added some olive oil and balsamic, and let it sit for awhile. Meanwhile, I sprinkled some seasoning on a boneless skinless chicken breast and put it with 3 strips of artisanal nitrate-free bacon (from Whole Foods) into a pan and roasted in the oven for about 30 minutes. 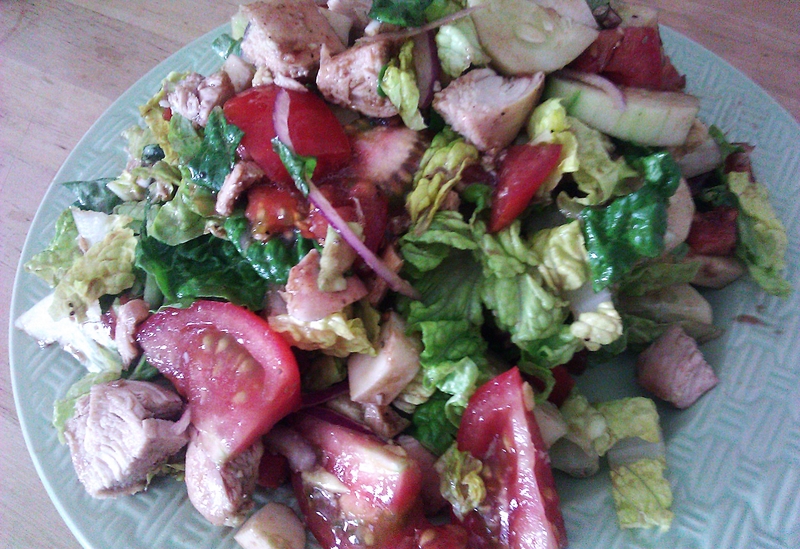 I chopped up a whole head of romaine, a whole cucumber, a tomato, and some red onion. I added 2 oz of avocado since I certainly have the points for the splurge. Here’s a pic of the finished product, It certainly doesn’t do it justice! This entry was posted in Healthy Eating and tagged chicken, chicken recipes, low fat chicken recipes, low fat chicken weight watchers, weight watchers on March 3, 2013 by admin. My spouse is traveling for work this weekend, so it’s been meals for one here around this house. I’ve been a bit under the weather and my appetite has been wonky as a result. I have been begrudgingly cooking my dinners (rather than just eating yogurt). I tried something new last night, and boy, it was out of this world! A friend of mine on Pinterest posted a recipe where chicken was rolled with minced garlic, basil, and a cube of mozzarella cheese. I thought this seemed like a delicious idea, so I wanted to try it out while the spouse was away – test driving, if you will. Of course I gave it my own spin. Basically I sliced the chicken lengthwise, to create a pocket. I lined the chicken with chopped basil, garlic, and one ounce of mozzarella cheese (not shredded). I simply closed the chicken by folding it over, brushed on a little olive oil mixed with salt and pepper, and sprinkled some plain breadcrumbs on top. I was just about to pop it in the oven when I remembered I had some crushed tomatoes in the fridge. I quickly spooned some tomatoes around the chicken – not on it and popped it in an oven for about 30 minutes at 350 degrees. Oh man, DELISH!!!!! The chicken alone was fantastic – reminded me of braciole. A nice wallop of basil and garlic. The tomatoes absorbed all the cooking juices and I served the chicken with the sauce on the side, so I could dip for extra flavor. Had it with simple roasted broccoli (olive oil and salt). This is DEFINITELY a keeper! I wish I had made a 2nd one to have as leftovers for lunch today! I’ve, well, flipped for Chobani Flips. It started out innocently with the Chobani Honey Bee Nana – honey greek yogurt with bananas. It was love at first bite. At the time, my grocery store only carried two flavors. These Flips were still very new. Next up I tried the Chobani Raspberry Choco fix – raspberry yogurt with dark chocolate morsels. While good, it didn’t win the same affection as Honey Bee Nana. It didn’t take long for my grocery store to pick up additional flavors of Chobani Flips. Next up I was able to grab Strawberry Surprise, which is strawberry yogurt with honey oats to mix in. Then I moved on to Vanilla Golden Crunch, which was pretty good – non fat vanilla yogurt with praline pecans, honey oats, and cornflakes. And then it happened. I saw an ad for a new flavor in my Cooking Light (or was it Weight Watchers?) magazine. I just had to have it. Luckily, my supermarket agreed and it was on the shelves the next time I needed a yogurt fix. I’ll admit I was a bit scared at first. Coconut yogurt? Would it taste like suntan lotion? I’m not the biggest fan of coconut, but I’m no hater either. Slap a pina colada in my hand and I’m a happy gal. The description definitely piqued my interest – creamy low fat coconut yogurt with toasted almonds and dark chocolate morsels. How could this not be delicious? My instincts were right. This yogurt rocks my world. So much so, in fact, that I just bought the store out of it on my last shopping trip. 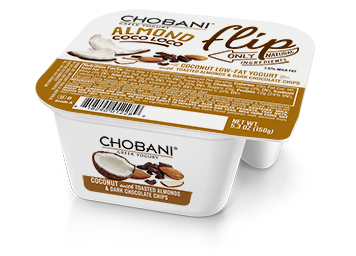 If you like coconut, definitely give this Flip a try! It is by no means low in fat, but, IMO, it’s worth the splurge! There’s one more Chobani Flip in their portfolio right now – the Key Lime Crumble. This one has so far eluded me. It’s a low fat key lime yogurt with crumbled graham crackers and white chocolate. Ummm, hello?? Why aren’t you in my store yet? I’ll definitely be picking this one up as SOON as I see it! 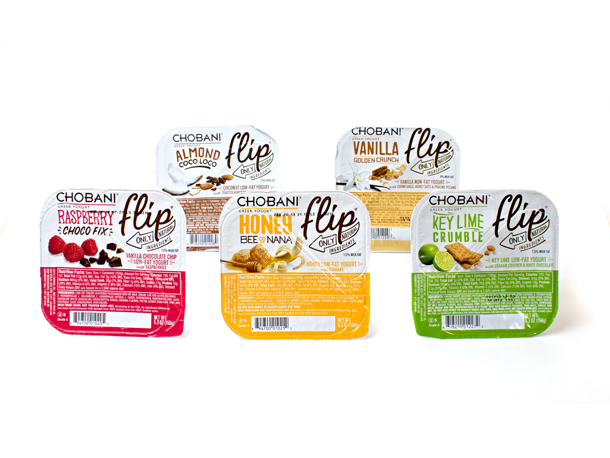 Have you tried the Chobani Flips? What do you think? Which are your favorites? This entry was posted in Healthy Eating and tagged breakfast, chobani, greek yogurt, weight watchers snacks, yogurt on March 3, 2013 by admin. I made a post over on the “What Are You Eating Today?” thread on the Weight Watchers forums, and it left me questioning my food choices. The problem here is after my breakfast and lunch, I have 28 points left for the day. This isn’t rare when I have 47 points per day! I’m trying to cut back on starches and carbs and focusing on protein and veggies, which is why I suspect dinner will be low. I’ve had a low appetite over the last few days, so I doubt I’ll be going out of my way to find snacks. I’m not a nut eater. I want to start juicing more but again, juices are 0 points if they’re all fruits and veggies. Do you have a ton of points leftover at the end of the day? What do you eat to meet your targets? This entry was posted in Weight Watchers Tips and tagged nutrition, weight watchers, weight watchers tips, ww, ww points plus, ww tips on March 2, 2013 by admin. We made a simple but delicious dinner tonight! Baked salmon, with light salt and pepper and a drizzle of honey. Roasted cauliflower (one of our FAVORITE ways to prepare cauliflower). Just olive oil and kosher salt. Asparagus orzo. Usually I make this with zucchini and summer squash, but I really felt like asparagus tonight. Sauteed some shallots and chopped fresh asparagus in a little butter, added orzo and toasted for a minute or two. Added a little white wine, low sodium chicken broth, and let simmer for about 15 minutes. Tossed in some fresh shredded parmesan cheese. Sooooo good! Happy to have another veggie orzo to rotate in. Just a quick post but I wanted to share a recap of our dinner! We really need to add more salmon into our diet. We love it so much… don’t know why we ever backed away from making it. We used to have it once a week when we lived in Brooklyn and could pick up a filet on the way home from the subway. Buying it fresh is so important. We’ll need to make more of an effort to incorporate it into our weekly planning. This entry was posted in Healthy Eating and tagged healthy eating, healthy recipes, low fat recipes, orzo, salmon, salmon recipes, seafood, weight watchers recipes on February 28, 2013 by admin. I usually reserve this dish for the summer, when my garden is full of gorgeous Jersey tomatoes and fresh basil. Toss together the bruschetta, throw a little of the liquid in with my chicken for a quick marinade, and throw the chicken on the grill. Simple, quick, light, and delicious! This bitter cold weather here in the northeast makes me long for warmer days. Or maybe just a day without so much rain! I’ve been feeling a little down lately and needed a good pick-me-up, plus I really wanted a huge helping of heart healthy tomatoes, fresh garlic, and olive oil, so I decided to make an indoor version of this tonight. I had it over a huge salad with some steamed broccoli. I just use the bruschetta as my dressing… delicious!! I didn’t think to take a pic, so definitely hop on over to the original source of the recipe for beautiful pics and comments. Adapted from Skinnytaste. See recipe here. 1. Combine tomatoes, garlic, basil, salt, pepper, olive oil, and vinegar. Set aside while you marinate and cook chicken (will keep overnight). 2. Place chicken in a bowl and carefully pour some of the bruschetta liquid over the chicken. Let sit for 15 minutes. 3. Prepare grill or grill pan (if indoors). Grill chicken until thoroughly cooked and no longer pink inside. 4. 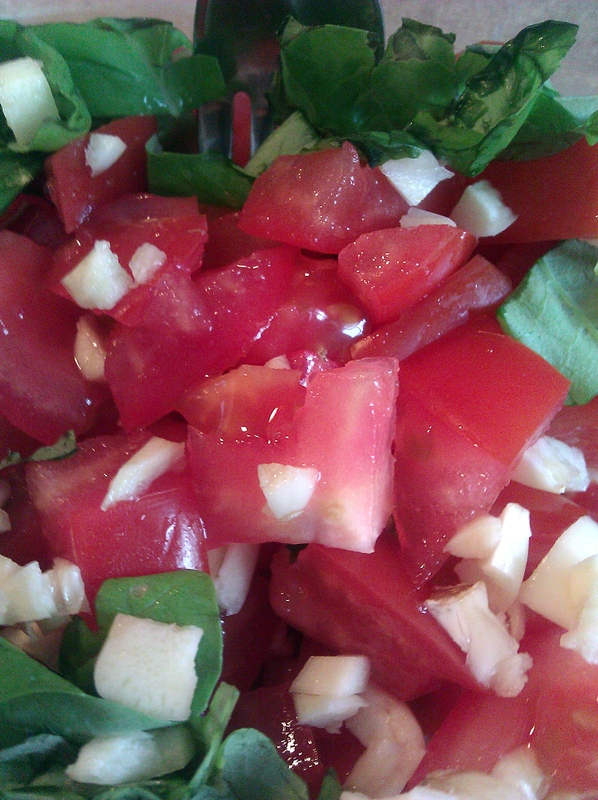 Add the diced mozzarella to the tomato bruschetta. 5. 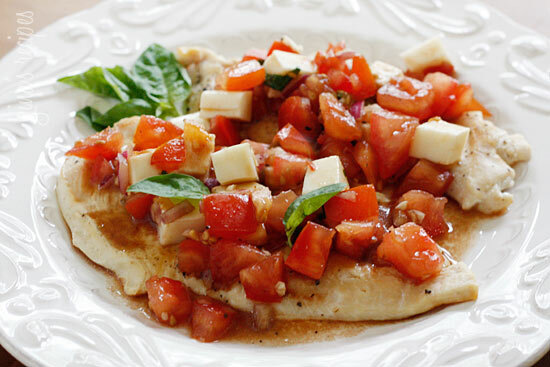 Top each chicken breast with bruschetta. Pile it on. Seriously. This is really one of our favorite recipes. Hope you try it out and enjoy it!! This entry was posted in Healthy Eating and tagged chicken, chicken recipes, low fat chicken recipes, low fat chicken weight watchers, skinnytaste, weight watchers on February 27, 2013 by admin. 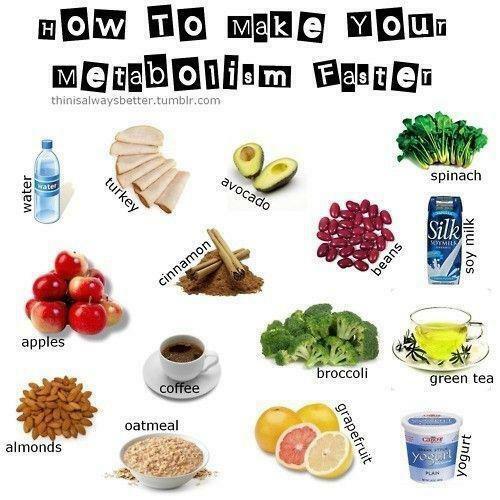 We are always looking for ways to speed up our metabolism. After all, having a healthy and active metabolism is key to losing weight. A critical part of speeding up metabolism is your nutrition intake. In order to get your body working correctly, you need to be eating the right foods. Here’s a handy chart that lists some pretty common foods and beverages you could be consuming to help speed up your metabolism. Most of these you’re probably already eating – why not add a few more? This entry was posted in Body Science and tagged body science, metabolism, nutrition on January 17, 2013 by admin. This entry was posted in Inspirational and tagged inspiration, inspirational, motivation, quotes on January 7, 2013 by admin.